Environmental and activist groups in Canada fold up their websites for a day on Monday to protest the government policies that will make it easier to build pipelines to transport oil from Alberta’s enormous oil sands. Joined by U.S.-based associations such as the Natural Resources Defense Council, the groups say Canada’s government is also trying to silence pipelines opponents. 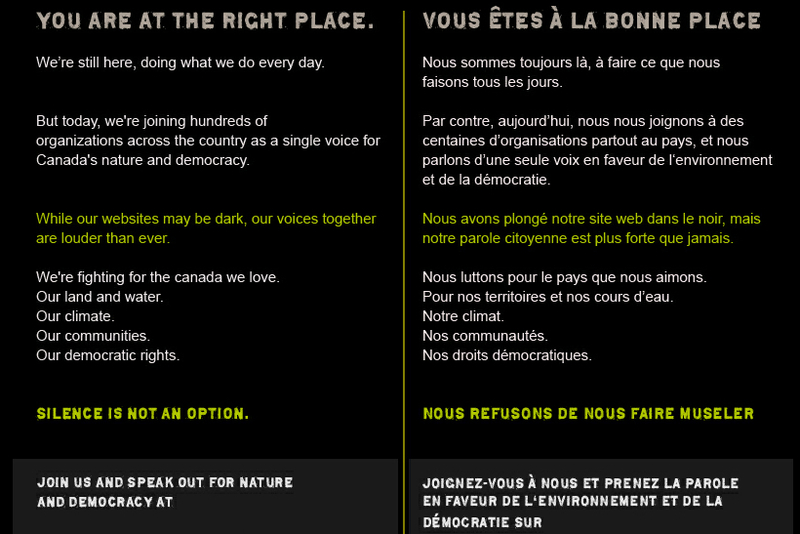 “The more a country becomes a petro-state, the less it values free speech,” Rick Smith of Environmental Defence said in a press conference in Ottawa to launch the “Black Out Speak Out” day of action. In response to the campaign, Prime Minister Stephen Harper's cabinet ministers decided to spread their support to the government's budget plan and its backing legislation, reports News1130. Led by Natural Resources Minister Joe Oliver, the authorities said the objective of the cross-Canada news conferences, was to counter the "exaggeration, distortion and outright falsehoods" of critics. “I think most Canadians realize we can have environmental protection — reasonable steps, reasonable processes on a timely basis — and at the same time have significant economic growth,” Finance Minister Jim Flaherty said at an event in Toronto. Late last week, Natives downstream from the northern Alberta oil sands said they have caught more deformed fish in Lake Athabasca and will be sending them away for testing. The Athabasca Chipewyan First Nation distributed the images of two odd-looking fish on Friday. The band has long called for better protection of the region's water. While it was initially suggested the fish was an example of how pollution can mutate wildlife, a University of Alberta biologist eventually determined that the second jaw was actually the fish's tongue that was pulled through its mouth by ligaments contracting during death.